International Driving Permit or International Driving License? What are they, do I need one, and why the hell is this so confusing? It is my hope that you stumbled upon this article because after asking around, looking at the Wikipedia page on the subject, and searching official and non-official channels, you ended up with more questions than answers. Yeah, that was me a few years ago. Hopefully this will be your last stop (if you’re American) and everything will be clear. To save you time, I separated everything into “essential info” and “additional info” for those of you who do not care about the history or the other nitty gritty details. This explanation is mostly for Americans and differs slightly per country. 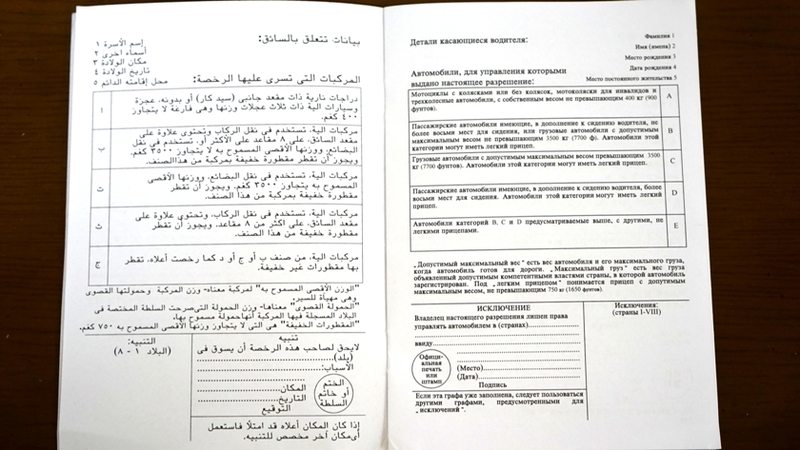 The official name for this document is an “International Driving Permit” or IDP for short. There is NO SUCH THING as an International Driving License. However, since many countries call the document that lets you drive a “license,” the name is sometimes used interchangeably. Rest assured, there is only one document type, and this is it. If you hold an IDP, you can legally drive in any of the countries who signed the 1949 Geneva Convention on Road Traffic. A full list is located within the document itself (pictured). This permit is NOT valid within the borders of the country that issued it. Some countries ratified one treaty but not others for one reason or another. For example, Korea signed the 1949 Convention, but not the 1968 Convention. Furthermore, Korea was unified in 1949, so currently, South Korea honors the treaty but North Korea does not. Germany had the opposite problem as it was not unified back then, but has agreed to pretend like they were and honor the IDP anyways. 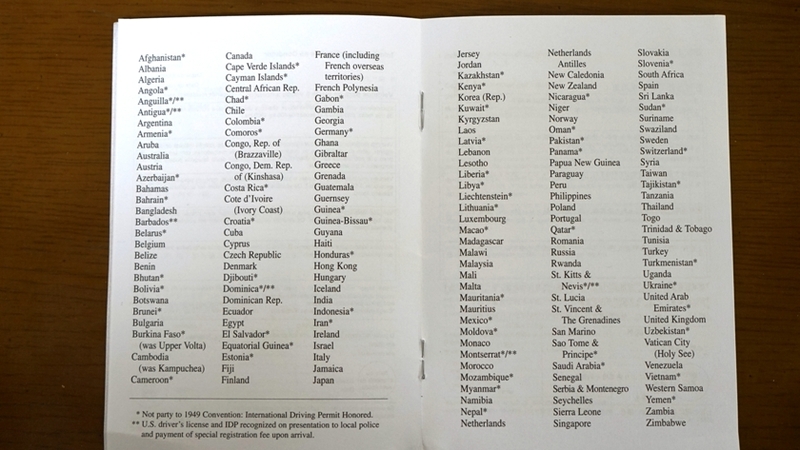 The IDP issued by AAA in the United States honors the 1949 treaty which includes about 150 countries. The reason an exact number cannot be given is that countries which were not in the original treaty (in this case, 1949) can jump in and out of the commitment whenever they feel like it. Furthermore, countries that have formed after the signing can choose whether or not to honor the treaty. WHY DOES AAA ISSUE THIS PERMIT? AAA was chosen in the US to handle IDPs. To streamline the process for countries which issue more than one version of a license (like how America has a license for each state), it was agreed that ONE company or organization should handle the IDP issuing process. AAA was chosen in the US originally but now is one of two companies who can issue it. If you are not American, check which organization has this authority in your country. If your country has AA, they handle IDPs in some countries. WHAT IS IN THE IDP DOCUMENT? The license types are listed as A-E. As you can see, I got a stamp for type B. The IDP is essentially a translation document for countries where English is not an official language. 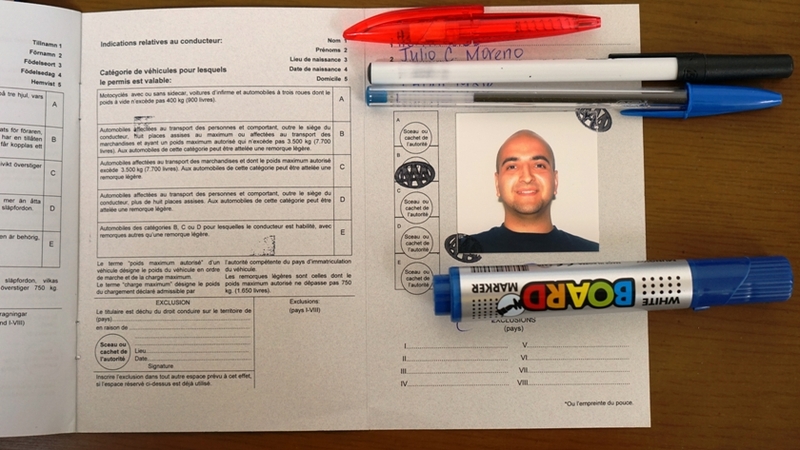 It also translates what the driver is allowed to drive in their licensing country to an international standard of five license types (pictured above). IS THE IDP JUST A TRANSLATION DOCUMENT? Some of the languages featured (10 in total). Technically, yes. The treaties main purpose was to accept licenses from foreign countries across borders, not to issue a universal license. For this reason, your IDP is not valid UNLESS presented together with your actual license. You might hear a lot of info out there saying that because it is just a translation document, the IDP is either useless, or unnecessary in general or in countries that speak English. It is true that in countries like New Zealand, you will never be asked for an IDP as proof of your license and your American license is quite enough. However, this is up to the country and not a general rule. Think about this: If you got stopped by a police officer in the tiny town of Oamaru, New Zealand and you present a Wyoming license, how would they know it is actually valid? Hell, I don’t think even I have seen one of those! Now expand that situation to 150 countries and you can quickly see how even IF the country you plan on driving in has English as their official language, they are not required to accept a foreign issued license if they don’t feel like it. 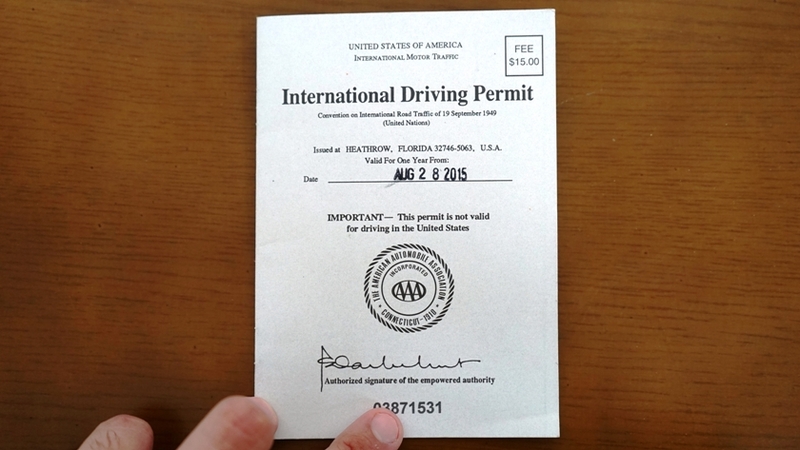 HOW MUCH IS AN INTERNATIONAL DRIVING PERMIT? $15 plus 2 passport sized pictures. If you are doing a walk in and DON’T have passport pics, don’t worry, they can do it there for a fee. COULD I GET AN IDP FROM ABROAD OR BY MAIL? It requires you to mail a few things to AAA in Florida and takes 4-6 weeks. If for whatever reason, you are from a country that follows and issues an IDP according to the 1968 treaty, it could be good “for up to 3 years.” Their vague words, not mine. However, the 1968 treaty encompasses much less countries than the 1949 one, so be aware of this. This is just a reflection of what your actual license allows. You SHOULD explicitly ask for verification if you have the appropriate license already. It also covers a lot more than just cars and motorcycles. Check the picture on the “What is in the IDP?” section above. For example, I have C and M1 class licenses from the state of California. This lets me drive motorcycles and cars in the golden state which is honored by the rest of the US. When I went to AAA the first time, I made sure to tell them to stamp class A (motorcycles) and class B (cars) on the IDP, which they checked and stamped. However, this time around, I forgot to mention the motorcycle part and thus, forgot to stamp class A. Does this mean I can’t drive motorcycles abroad? This is a technically grey area because, more than anything, AAA just forgot to verify / translate. The foreign country COULD refuse to rent me a motorcycle but I COULD argue and show my actual license which COULD be accepted if anyone knows what M1 means. In the case of renting a bike, I think I COULD win that case. Legally, I wouldn’t count on it. ANY ADDITIONAL THINGS I SHOULD KNOW? The IDP is NOT valid if you are planning to live in a country long term (working abroad) in many cases. For example, Korea requires any foreigner who works in the country to get a Korean license (which is an equally confusing mess). There is no way to get the IDP for more than 1 year without repeating the process every time. I asked. AAA had a great FAQ you should check out. It is short, I promise. Not every country will ask for an IDP. South East Asian countries are notorious for this. Even so, get one if you can. You are more likely to be scammed if you are willingly driving illegally than not. In Thailand and Indonesia, cops routinely stop foreigners and issue ‘fines’ (bribes) for driving without a license. Furthermore, rental places routinely look for excuses to charge “repair fees.” Having an IDP makes you look like a boss. Some countries ask if you have an IDP, but never bother to check for it (my experience in Korea and Japan). Some ask to look at it, but it is clear they have no idea what it is supposed to look like. If you get into an accident without an IDP, you are royally screwed. Bali companies, for example, will not issue car insurance to people without IDPs, despite them speaking English and recognizing a legit license. Hong Kong and Macao allowed the IDP under British and Portuguese rule respectively. However, China has never signed any of these treaties. As such, China honors the IDP only in those territories and NOT in the mainland. I think I covered like 93.7% of all situations so if you think there is something I missed, or have additional questions, leave a comment below and I’ll get back to you ASAP. ← Working Holiday in New Zealand pt.4 – Was it Worth It? I’m Vietnamese and I hold IDP issued by our country AA and Vietnam is a member of the 1968 Vienna Convention. I’m going to the USA on a tourist visa and I wonder will my IDP be accepted in the USA which is a member of 1949 Convention? and for your information I will travel to California, Oregon and New York. Yes, the 1968 amends the 1949, so it should work but not everyone is up to date. I’d call the rental agency to make sure but should work. As far as I know it is not legal, but widely accepted. E.g. Germany issues IDPs also according to Vienna 1968. So legally I am not allowed to drive in the US. And everybody accepts it. Though, I you encounter an officer on a really bad day or maybe get into a bad accident where lawyers will get involved, I am not so sure how it will play out! BTW: As an officer, you will never be able to really tell whether a license is real or not. I’ve heard of cases in Saudi Arabia were travel agencies were handing out IDPs to women, so that they could drive while on vacation in Europe, without owning a local Saudi Arabian license. Then also the other way round in a different country: an immigration officer refused entry at first because he didn’t believe the country (a Baltic state) of the passport holder actually existed! Why would it not be legal in the US? The US signed most if not all of these treaties, making the joint IDP+license of Germany legal in the US. In a crash situation, it would be up to the insurance issuer in the US (which is usually automatic when renting a car as I learned the hard way last year). In case of death or bodily damage, the same US laws would apply as any other American driver. According to the IDP treaty, no country should accept an IDP without a joint license. So, if a Saudi woman shows the IDP without a license, it should not count (rental companies SHOULD know this and would legally also be on the hook if they didn’t bother to check). I admit, there is a whole ton of confusion, which is one of the inspirations for this post. Thanks for commenting and I hope this cleared things up. Well, as far as i know (and could find out) the US didn’t sign the Vienna 1968 treaty. So the IDPs according to the Vienna treaty (like Germany is issuing) is not officially accepted in the US. At least this is, what I think. On the other hand, it is “just” a translation, with many similarities to the Geneva-IDPs. Since it’s just a translation, it doesn’t grant additional rights, so this could also add to the fact that I’ve never heard anyone having a problem with the Vienna-IDP. However, I’d like to know what a lawyer would say in court if it’s a matter of several million USD. If it IS legally accepted, of course there shouldn’t be any difference to a holder of an American license. The case of rental companies giving out cars is a bit more difficult. I assume that most Saudi women do not rent the car themselves, but their husband. If HE let’s her drive, HE could be facing criminal charges. But also often the police seem unaware of the fact, that the IDP needs a local license (which is impossible for any woman being resident of Saudi Arabia, no matter of citizenship; however, they may already have or obtain a license that is accepted in the country they’re visiting, like a French woman keeping her French license when moving to Saudi Arabia, she will still be allowed to drive anywhere where the French license is accepted. Likewise, a Saudi woman living in Europe, getting her license their, and going back to Saudi, can keep her European license and use it wherever it is accepted. However, if the country visiting requires an IDP, she will not be able to legally drive there, as she is now a resident of Saudi Arabia and thus the IDP must be issued by this country, and for this, her original license also needs to be from Saudi Arabia). Sorry for the lengthy reply. I hope I didn’t oversee anything substantial. One must have it as an obey to the rule and to free yourself from danger or trouble. There’s no harm if you are prepared from anything! Per the 2011 amendments to the 1968 agreement, if your license is in the new numbered format (i.e. each of the elements is numbered like the ones in this example http://www.thetruthaboutcars.com/wp-content/uploads/2013/09/WA-DL.jpg), then it is supposed to be honored directly and you no longer need an IDP. This is because all the signatory countries recognize that system and officers are supposed to know what each numbered attribute represents (e.g. #1 is the person’s family name, etc.) That said, some countries (Italy comes to mind) haven’t updated their laws yet and still require an IDP, so be sure to check each country’s laws. I should clarify that my earlier comment was regarding countries that are signatories to the 1968 convention, which you can find on Wikipedia here: https://en.wikipedia.org/wiki/Vienna_Convention_on_Road_Traffic (and which interestingly the US is not.) Perhaps a better way to determine what you need is this report I found on the Canadian Automobile Association’s website which includes a list of requirements by country: https://www.atlantic.caa.ca/files/travel/IDPRequirement.pdf . It’s a little dated but probably still mostly accurate. Any reference to “Annex 6 of 1968 Convention” is the license format I was referring to. All of that said, if in doubt, get an IDP; better safe than sorry. Not sure to be honest. Call AAA and they will know for sure. Where are you headed? Working Holiday in New Zealand pt.4 – Was it Worth It?